Knights of Creativity Spirit & Ale: Can you? It’s true, my brothers and I had hundreds of cans. But, that’s nothing compared to a couple of collections that follow. First up: The Museum of Beverage Containers and Advertising in Millersville, Tennessee. Many years ago Lady Suzanne and our young daughters give me a father’s day gift of allowing me to travel way, way out of our way to The Museum of Beverage Containers and Advertising. They still roll their eyes at the mention of it; I want to go back!. The Museum – the collection of basically of one family -- Museum contains over 36,000 different beer & soda cans, 9,000 different bottles, and all types of advertising. 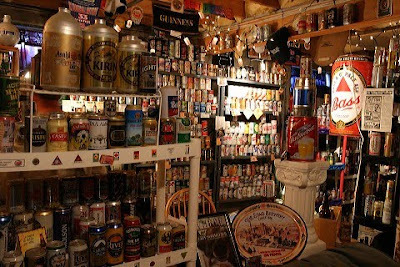 Second: The Beer Can Hall of Fame (and Museum) near Boston. What is it about collecting stuff? 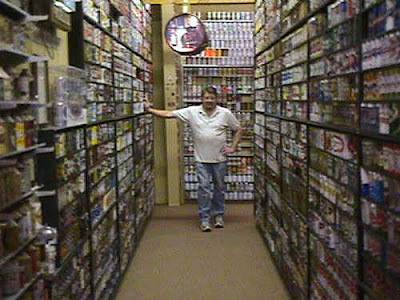 Over the years I’ve collected baseball cards, Pez candy dispensers, root beer mugs, MAD magazines (just to name a few). "No one is quite sure how many of these oddball exhibits exist, because many are set up in private homes, open by appointment only. Officially, the Institute of Museums and Library Services in Washington classifies them as "collections of curiosities," not educational enough to gain true museum status. But some academics are not so quick to dismiss them as random junk." "There's something about bringing [ordinary objects] together as a collection that lets you see a phenomenon in a way you wouldn't otherwise.... And there's something about the relentless focus of really hard-core collectors that's impressive and intriguing in its own right," said Barbara Kirshenblatt-Gimblett, a professor at New York University who has written extensively about the interplay between food and culture. "What the Museum of Modern Art does in classifying paintings by genre and period--that's the same thing that the Mustard Museum or The Beer Can Museum or the nut museum is doing," Steiner said. "Only, unlike modern minimalist art, these museums are dealing with something that everyone can relate to." 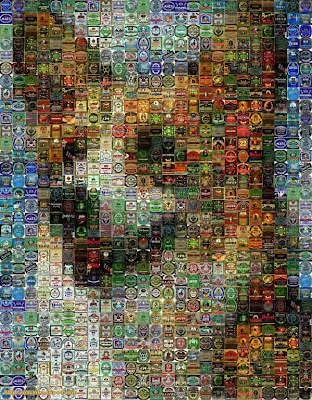 An enterprising beer can collector created this portrait of one of the Queen’s corgis from flattened duplicates. So, fellow Knights, what do you collect? FYI: The world's largest beer can collection and is now at 75,000 - a third of all the types of beer cans ever made! and let's not forget journals. As a grown up. Typefaces and Fonts, i have a minimum of 30,000 named ones and the same again of un-named ones, and several hundred historical ones, and several hundred again of ancient and foreign alphabets. I also collect Symbols, motifs, logos, Signets, simple signs and historical graphic devices. I have a brain that is good at recognising patterns and shapes, but not one that is good at numbers and business. I once read a book that explained the Psychological reason men ( mainly ) get involved in collecting. I've forgotten most of it but i believe it involved the usual male suspects of Ownership and Control. It may be a coping mechanize. unable o control the order of outside things, can control the order of a given set of objects. frogs and snowmen fall into the category of "never mention you like it...you'll end up with dozens as gifts"
They represent a small world which I can research history, make clothing and bedding, make up stories about the families and pets that live in them, create, using many interests in one hobby. And I can control my own little corner of the world - very important! and we do have a house "with personality" as many visitors say! luckily our girls are adventurous also! Willing to make another roadtrip - it's a cool place! the Ticks song is by Brad Paisley, since I think Sir D of O will ask!